Learn to recognize the signs of depression and get help. While depression is very complex. It varies in type and requires special attention to be treated accordingly. 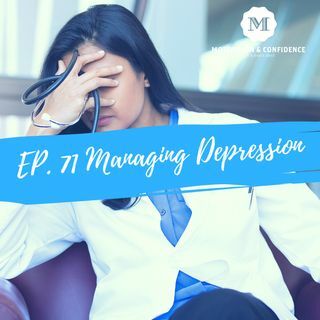 In this episode we discuss 5 methods that can be used to manage Atypical depression. If you feel as if you are suffering from depression seek help from family, friends or a Professional. We will have a more in depth discussion with a lcensed professional in future episodes. Like, subscribe and share. This week, ... Más informaciones we're going to talk about how to manage depression. This is a very complex subject, but I know that I have listeners, friends, and family who struggle with depression for various reasons, and there are several different types of depression. I believe the type that I'm going to speak about as atypical. You can look it up online, but it's more a, I want to say, a general type of depression for the sake of defining or clarifying to some people who may not know what depression is in a definitive sense. People just say I'm depressed, but it a state of feeling of being depressed. It's a mood, a disorder, which is marked by sadness, inactivity, difficulty in thinking or concentration, increase or decrease in appetite in time spent sleeping, feelings of dejection, hopelessness, and sometimes, suicidal tendencies. Okay? Let me preface this by saying I am not a licensed professional. This is not medical advice that I am giving. This is just as the rest of the podcast or the rest of the episodes, me sharing my stories and providing listeners with some tools that they can use to deal with things in a daily basis and to help you do your daily best. I got a letter ... Let me stop. Let me start here. Okay, I'll take a step back. Looking at the internet sometimes, in all of its illusions, can be depression. I'll sort of put myself out there for a second. A person may look at my Instagram or Facebook page and say, "Hey, this guy is always eating healthy, he's exercising, and he has the perfect family, he always looks as if he's into the arts and always has something going on, and just looks like everything is so perfect," but in fact, it's the total opposite. Okay? I have several things that I struggle with, and I spoke previously on one being anger issues. At one point in my life, I had a very challenging time to control my temper. I took it upon myself to seek therapy not once, not twice, but three times, until I felt comfortable to the point to where I could manage my anger. I'm happy to say that at this point in time, it's not something that bothers me as much as what it used to or gets out of control as much as what it used to. I've learned how to manage it. That's one. Two, I have several struggles that I deal with within my family. I spoke about this before as well. I deal with eldercare. I deal with childcare. I deal with marriage and self-care. At times, juggling and balancing all those different things and being so much to so many different people, in itself, can be a challenge. I think that, at times, I go in and out of depression. I think part of the reason why I always exercise and do my best to eat properly, I've continually had challenges with sleeping for long periods of time. I don't sleep for a long period of time. I usually take a nap and go back to sleep, and sleep four hours or so, but that's my thing. The reason why I focus on those other positive things, it is to offset all the crap that I have to deal with because, sometimes, especially in eldercare, when the health of your elders are not in the best of states, it can actually wear on you. It's almost like a transfer of energy. When you're around people who are ill all the time, sometimes, you start to feel as if you're getting ill too. Also, I know that, historically, in my family, we suffer from high blood pressure, diabetes, heart problems, obesity, and I wanted to create a lifestyle to where I knew that I was doing the best that I could to make sure that I could manage those things and not let it get out of control because I have so many people depending on me. That's my illusion, so to speak, of the internet. Then you have other people in the internet that just also, standing on the outside looking in, you'd think they have a perfect life. I'm pretty sure that all of the perfect pictures that are openly modified. A lot of people say that they will enhance their selfies. A lot of phones come with the features now where you can slim your face and slim your body, and make people think that you look a particular way when you're not, or people who look as if they're in the gym all the time, and they have the perfect body, and they have the six-pack, and there's other people who look as if they have certain luxuries and they're always traveling, and they have all of these nice cars and jewelry and houses, when, in fact, a lot of it is really a façade.